I'm not exaggerating when I say I can eat an entire bucket in 5 minutes or less. 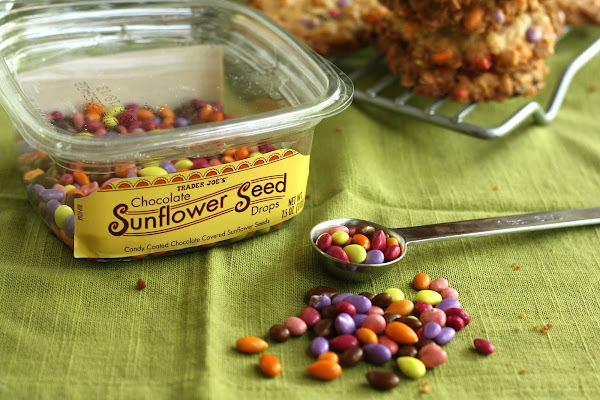 I remember there was one time I brought a bucket of these sunflower seeds on a road trip with friends, only to have them stare at me in stunned silence as I tipped the bucket into my mouth unabashedly and ate the entire thing in a few bites. No, literally -- I think at one point I was just swallowing the seeds without even bothering to chew them. In any case, my rather, ah, disgusting enthusiastic eating habits gave me an idea. 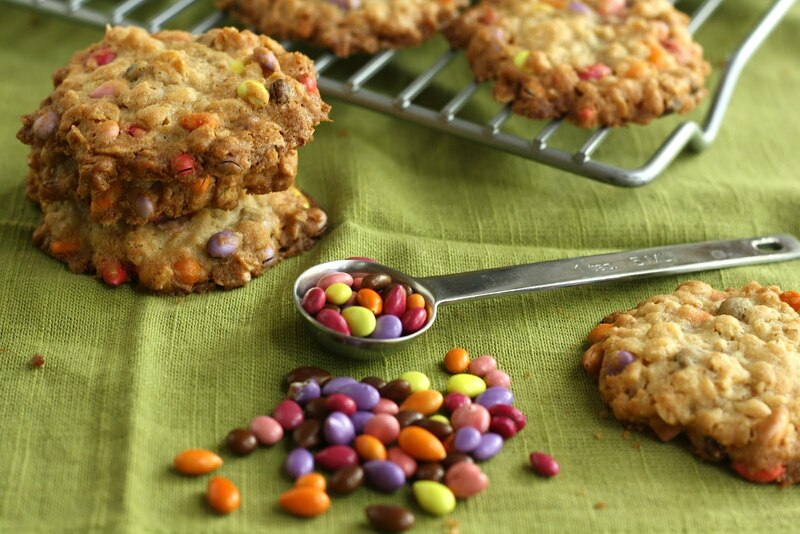 Why not combine two of my favorite things and put the chocolate covered sunflower seeds in some cookies? I decided to add them into my standard recipe for oatmeal cookies. 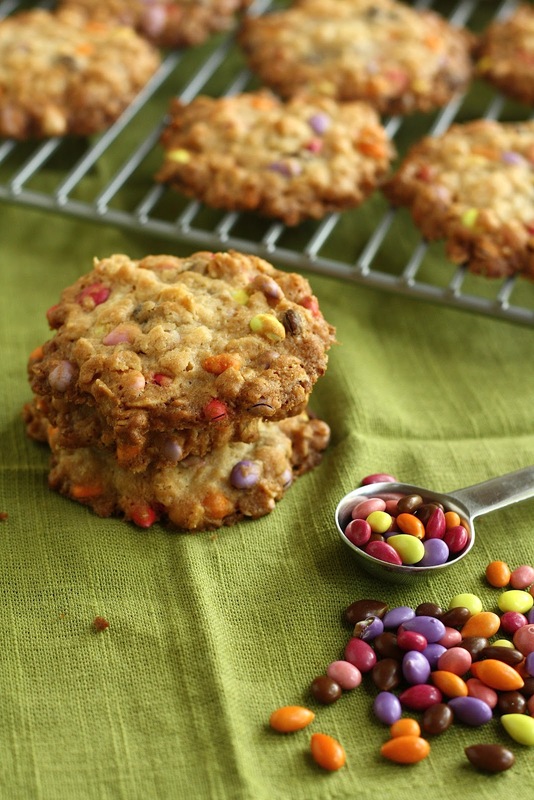 I love the combination of chocolate and oats, and I figured that the chocolate from the sunflower seeds would give my crunchy oatmeal cookie recipe an additional chocolatey, nutty flavor. This particular recipe produces crunchy oatmeal cookies, which is notable because most of my recipes tend to produce chewy cookies. I normally love chewy cookies, but I guess I like the additional crunch that comes from the toasted oats since I tend to favor crunchy oatmeal cookies? It also doesn't hurt that it solves my rather unsightly tendency of swallowing chocolate covered sunflower seeds without chewing them. So there's that. Win-win all around, right? Or something. Combine 8 tablespoons unsalted butter, 1/3 cup light brown sugar, and 3 tablespoons granulated sugar in the bowl of a stand mixer fitted with a paddle attachment (or use a handheld whisk) and cream together on medium-high for 2 to 3 minutes, until fluffy and pale yellow in color. Scrape down the sides of the bowl with a rubber spatula and turn the mixer to its lowest speed. Add 1 egg yolk and increase the speed to medium-high and beat for 1-2 minutes, or until the sugar granules fully dissolve and the mixture is a pale white. In a medium bowl, whisk together 1/2 cup all-purpose flour, 1/2 teaspoon kosher salt, 1/8 baking powder, and a pinch of baking soda. On low speed, add this mixture to the butter mixture and mix for a minute until the ingredients have just been incorporated. 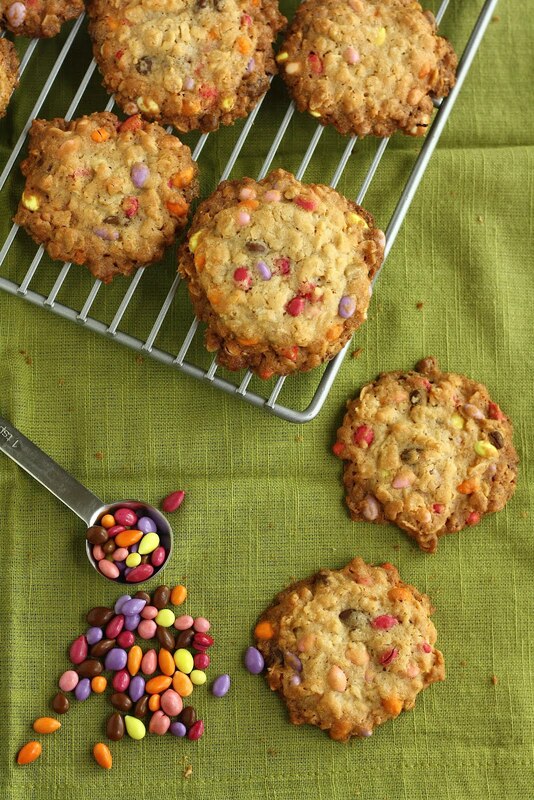 Using a rubber spatula, stir in 1 1/2 cups old-fashioned rolled oats, followed by 1 cup chocolate-covered sunflower seeds until both ingredients are well mixed and fully dispersed throughout the dough. Line a cookie sheet with parchment paper, and use a cookie scoop to scoop out 1 tablespoon-sized balls of dough, leaving 2-3 inches of space between each cookie. Bake for 15 minutes in the preheated oven or until the cookie is caramelized on top and is puffed slightly but set firmly. Let the cookies rest on the cookie sheet for a 5-10 minutes, before turning out on a cooling rack to cool completely. Thanks! Be warned that these cookies are super crunchy, so if you like chewier oatmeal cookies, you might want to go with your standard oatmeal cookie recipe.